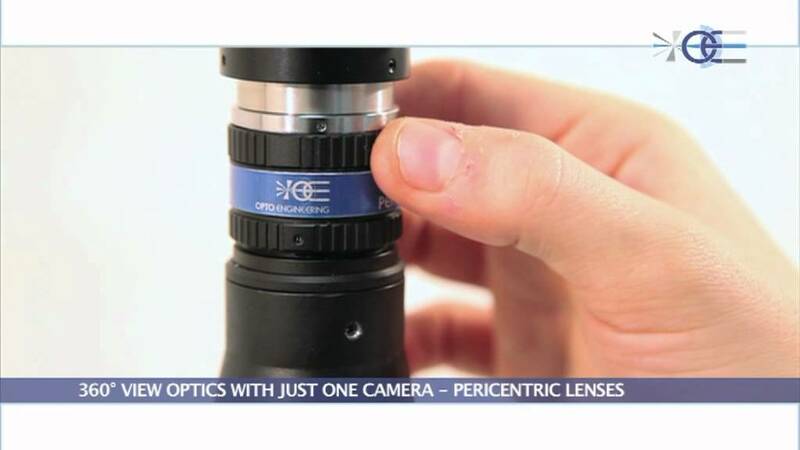 Pericentric Lenses are an exclusive product developed by Opto Engineering to enable 3D peripheral vision of objects without the aid of mirrors. By means of this unique optical design, just one camera shot is enough to capture the top and side views of an object. The name “pericentric is because of the specific path of the light rays: the aperture pupil is seen from object space as if it was moving around the peripheral zone of the front optical group. Pericentric lenses are designed to work with 1/2 and 1/3 detectors. The choice of such detectors grants the most appropriate optical magnification factor to achieve the field depth required by high resolution 3D pericentric imaging. The image of the front surface of the object and its sides are inscribed into the short side of the camera detector. The smaller the object diameter, the larger the object height which can be inspected, while thin objects can be inspected over a larger diameter.